Proprietors and principal editorial officers of the S. A. Register. From left to right: W.W.R. 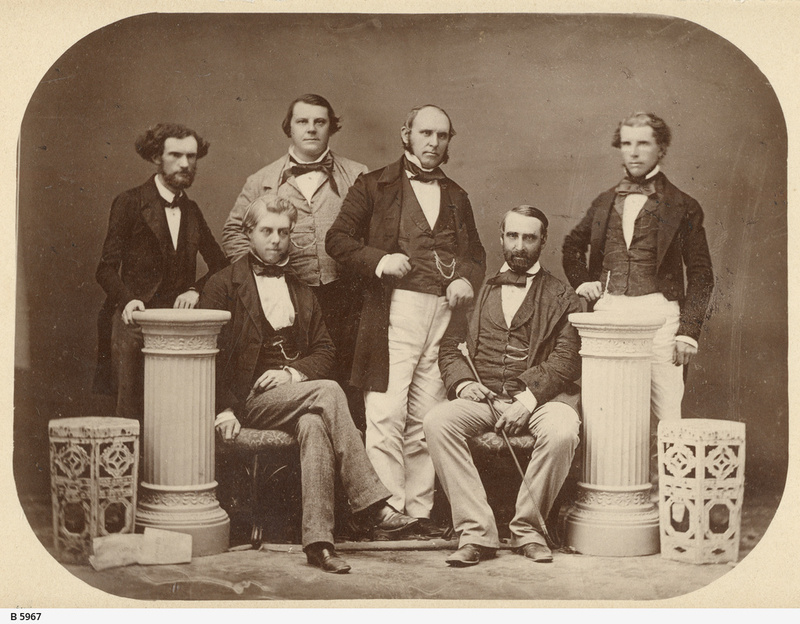 Whitridge (on editorial staff); Joseph Fisher (proprietor); William Kyffin Thomas; Anthony Forster; E.W. Andrews; J.H. Barrow (editorial staff). Robert Thomas established the South Australian Gazette and Colonial Register [newspaper] , and later the Register newspaper. Mr and Mrs Thomas were accompanied by their children Frances Amelia (Skipper) 1818-1855, Robert George, 1820-1885, William Kyffin, 1821 -1878, Mary (Skipper), 1823-1881 and Helen (Mantegani), 1825-1921. Another child, Alfred, died in infancy. Mar. 24, 1840. There are at this time the following persons employed in the office of the South Australian Register:- My brother William, Mr. William (senior clerk), Daniel Higgins, Thomas Higgins, Mr. Bonnar, Mr. Halliday, John Foreman, Little George Foreman, Mr. Brock (press-man), Mr. Connelly (press-man), and a clerk under Mr. Williams, William Hillier, Mr. Bennet, William Hay, Henry Curran, Astley Cooper (boy), Lindsay Cooper (boy), and Abraham Brookes (bill sticker). Pitt, G.H. The press in South Australia, 1836-1850 Adelaide, S. Aust. : Wakefield Press, 1946.